Onsite or in my studio in Surbiton, Greater London. Learn in private workshop sessions how to create 3D models on a computer. Learn SketchUp in easy to follow practice steps. Carefully structured to ensure lasting progress. Strong focus on practising and working on real interior design projects. Each training is packed with practical tips, tricks and resources. The course will be tailored to your entry level and your individual requirements. Especially suited for “non techies". We will meet in person in my Studio in Surbiton or at your address in London. All the SketchUp basics from workspace introduction, drawing in 2D and 3D, navigating around, measuring and precision, move, rotate, copy, push & pull. Interior and exterior modeling. Importing image files or files from other programs .dwg, .3ds, 3D Warehouse. Modeling workflow, working with styles, scenes, shadow settings, organising models. Learn how to create and work with groups and components. How to streamline processes and work faster. How to save time with model organisation. Introduction to Plugins and how to use them. Learn how to export 3D models as images or movie clips and how to present your 3D model on iPad, Computer, TV Screen or printed paper. Project models, working files, workspace templates for future use are included. Written app style "cheat sheets" from all sessions ready for your smart-phone. Clear understanding how to work in SketchUp. You will be able to create 3D room models on your computer. You will gain confidence in 3D modeling and you will have fun doing it. You will learn how to export and present your 3D interior design concept to an audience. How to avoid the most common and time consuming mistakes. How to do more with customised styles, textures, shadows for better looking models. How to explore the world of photo realistic images and artistic transformations of your model. How to edit exported JPG photos and movie clips of your model for use in other programs or for presentation. How to combine computer generated 3D images with your architectural drawing skills on paper. How to do more with your 3D visualisation on smartphones, tablets and social media. How to use SketchUp LayOut for your workflow and for presenting your work. How to organise and work with large model files. How to streamline processes in every day life in an Interior Design studio. How to continue learning after our workshop. *It depends on your entree level when you join. Interior Designers, Interior Architects, Students. Kitchen Designers, Shop planner, Fitted wardrobe specialists, Bathroom designers. Anyone who wants to learn how to create 3D/VR models on a computer. At any age and entry level. For personal or professional reasons. have access to a computer in order to practice and communicate with me. have a Google, Skype or Facebook account or the Mac Messages app on your computer. This is how we connect online. have SketchUp Make or SketchUp Pro downloaded from SketchUp™. 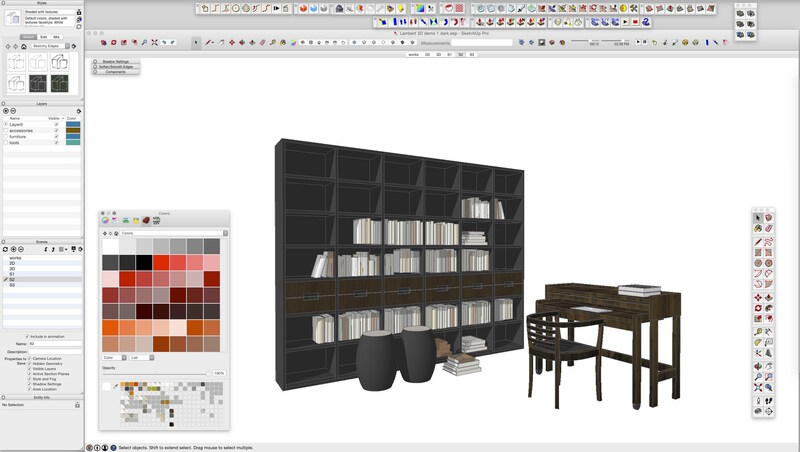 3D SketchUp for Interior Designers. Private One to One workshop for 1 participant. At your/any address in London. I will contact you as soon as I have received your booking and we schedule the dates and discuss the details. Please check also our FAQ page. Learn SketchUp private and master the most popular 3D modeling software. Gain new knowledge. Become a better SketchUp modeler, and save time every day. Learn how to combine your "traditional" drawing skills with computer generated images. Learn “3D SketchUp for Interior Design” from a practising designer who keeps the technical nitty-gritty to a minimum. Add to your interior design and drawing skills the (essential) missing part for the digital age. Improve your 3D modeling skills and create really good looking personalised models. Have a working 3D model file of your interior design project at the end of the course. Evaluate SketchUp with a professional teacher before making long term investment decisions. Become knowledgeable about 3D modeling, virtual reality and augmented reality. Discover new ways how to approach the Interior Design process. See inside a new culture of designing. Learn something new. Learn everything important for "real world" use. Learn how to set up your workspace and how to make the most of the available toolsets. Find out how useful 3D SketchUp can be for your work as an Interior Architect. Your new knowledge will make it much easier collaborating with others in your industry. Streamline processes. Learn how to get results faster. Discover to use today's technology to your advantage. Even if you are not so much a “techie”. Find out how to start a project. Learn how to model faster. With precise dimensions. Learn how to use groups, layers and scene settings for better results right from the beginning. Find out how to manage larger models. Learn how to create stunning presentations with SketchUp Pro LayOut and with Apple Mac Pages. Learn how to get from “white” to a great looking 3D model. With custom textures and individualised details, from the 3D Warehouse or other sources. Ready to get started? Any questions? You can also email me here if you prefer. Before dialing, check out my "Frequently Asked Questions" page. Stay in touch. Join my mailing list.